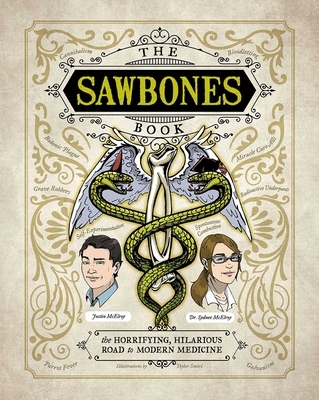 Every week, Dr. Sydnee McElroy and her husband Justin amaze, amuse, and gross out (depending on the week) hundreds of thousands of avid listeners to their podcast, Sawbones. Consistently rated a top podcast on iTunes, with over 15 million total downloads, this rollicking journey through thousands of years of medical mishaps and miracles is not only hilarious but downright educational. While you may never even consider applying boiled weasel to your forehead (once the height of sophistication when it came to headache cures), you will almost certainly face some questionable medical advice in your everyday life (we’re looking at you, raw water!) and be better able to figure out if this is a miracle cure (it’s not) or a scam. Teylor Smirl is a graduate of New York’s School of the Visual Arts whose work has been featured in comics such as Amazing Forest as well as her own series, Flightless Birds. As Sydnee’s sister, she is part of the ever-growing McElroy (and family) podcasting empire, co-hosting Still Buffering with Sydnee and their youngest sister, Rileigh.